Weighty Matters: Heart and Stroke Foundation pushing video gaming for fitness now? 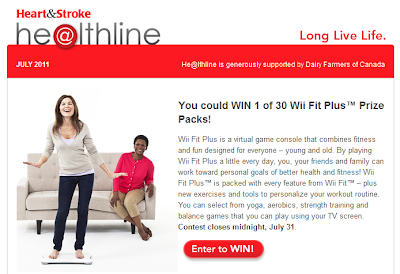 Heart and Stroke Foundation pushing video gaming for fitness now? Yesterday I received a copy of the Heart and Stroke Foundation's monthly newsletter, "Healthline". A give away contest that clearly reveals a bizarre Heart and Stroke Foundation/Nintendo partnership where Nintendo, at the very least, has given them 30 "Wii Fit Plus Prize Packs". So what's in it for Nintendo? "By playing Wii Fit Plus a little every day, you, your friends and family can work toward personal goals of better health and fitness!" I can play Wii Fit Plus "a little everyday" towards my goal of better health and fitness? That sure doesn't reconcile with my take of the Wii medical literature. My understanding is that Wii Fit burns negligible amounts of calories, and has never been shown to have any significant impact on "fitness". "Heart rate during Wii aerobics fell below the recommended intensity for maintaining cardiorespiratory fitness"
"The energy used when playing active Wii Sports games was not of high enough intensity to contribute towards the recommended daily amount of exercise in children." Furthermore, another recent study demonstrated that video game playing increased food intake in adolescents. Ultimately what we have here is a great example of the risks inherent to public/private partnerships between industry and health organizations. While at most you might argue that Wii Fit's a better choice than a sedentary gaming console, to suggest playing it "a little every day" will have any real impact on the personal goals of better health and fitness simply isn't evidence-based, and grossly misinforms anyone who's reading this Heart and Stroke Foundation circular. And really, should the Heart and Stroke Foundation be promoting video game use? Unfortunately, I'm not surprised in the slightest by this promotion. After all, it fits perfectly with the Heart and Stroke Foundation's "less bad" equals "good" pattern they've so readily established with Health Check, much to the detriment of a trusting populace. Sadly, the Heart and Stroke Foundation promoting Wii Fit for exercise is no more beyond the pale than their Health Check program promoting restaurant and processed meals for healthy eating. In effect what the Heart and Stroke Foundation's saying is - screw actual exercise and home cooked meals - they're for suckers! Instead let's get people playing Wii Fit and going to Boston Pizza for dinner! And for what? A few dollars? Greater brand exposure? Some misguided belief that "less bad" will actually make a positive, rather than a negative difference? I bet you don't love dogs this much! Do high salt diets impair reading comprehension? Not every kid's excited about learning to ride. Krispy Kreme for the Cure! Does U2 think your weight is shameful? Burger King has a "Reading Club" for 6 year olds? At what age do people begin to get "cute" again?